Most cars will have more than one type of clip. We try to make sure our photos are as clear as possible so you can identify the correct parts. VW Part Number: 7L6868243. Total Length Top to Bottom Point : 32mm. BEFORE YOU BUY- Make sure these are what you need. 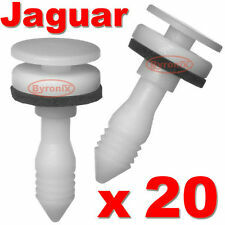 These are not the only fasteners used for the doors - we cant guess which ones you need this is just one type. T5 & T6 Transporter. This pic is very clear and can be enlarged. These are used to fit interior trim panels and linings across the range of T4 and T5 Transporter vans. 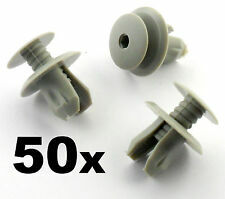 They are a plastic clip which screws to release and is distinctive because of it's hex head. 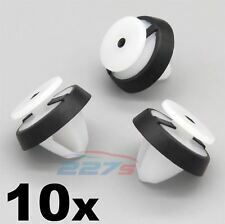 They fit into a 9mm hole. 1 x Fastener Removal Tool. Material: Plastic. We are always making efforts to providing better products and service. 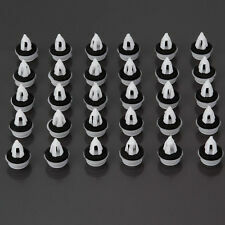 30 x Fascia Retainer. Retainer Sizes: 19 most Popular Sizes. 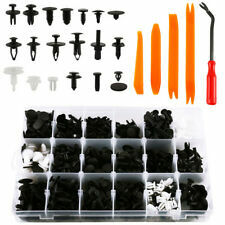 55 x Weatherstrip Retainer. 35 x Fender& Bumper Shield Retainer. 40 x Weatherstrip Retainer. 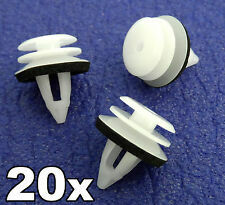 30 x Hood Insulation Retainer. 25 x Retainer. 20 x Push Type Retainer. TO FIT - VW T5 & T6 Transporter. This pic is very clear and can be enlarged. IF YOU DONT HAVE AN OLD CLIP TO COMPARE TO THE PIC DONT BUY - YOU CANT BUY A CLIP FOR A HOLE IF YOU DONT KNOW WHAT THE CLIP SHOULD LOOK LIKE - UNLESS YOU HAVE CHECKED WITH A DEALER THAT THE HOLES YOU NEED THEM FOR IS THE PART NUMBER AS LISTED. Volkswagen Golf IV and Bora. Volkswagen Passat B5. 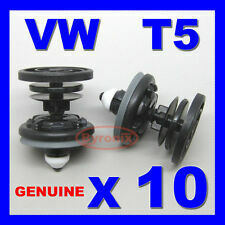 VW Part Number Part Number: 3B0868243 to fit following models. Volkswagen 337/20AE. Volkswagen Jetta IV. Volkswagen Jetta IV GLI. Volkswagen R32 MKIV. VW corresponding number is 823867299. Identical to Peugeot Part Number: 6991. We try to make sure our photos are as clear as possible so you can identify the correct parts. There is more than one type of clip used on the door cards and trims so p lease check your existing or an old clip to make sure it is the correct type you need. IF YOU DONT HAVE AN OLD CLIP TO COMPARE TO THE PIC THEN DONT BUY. 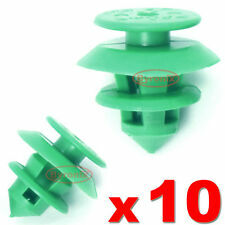 They are green and include the foam sealing washer which ensures a good fit and prevents rattles. They are used on the Skoda Fabia, Octavia and Roomster. Audi part number is 8E0-868-243. As Used on Many Porsche Boxster 986 Models & 911 ( 966 type ) models. 10 X Vauxhall Vivaro. If you need a clip for your door card you cant just buy these because they are for door cards, a door card, as with many trims have many different types of fasteners - That is why we say to check an old clip first to see if the type you need is the one as pictured. Vauxhall / Opel Interior Door Card Mounting Clip. They are used by the General Motors group which includes Vauxhall and Opel. 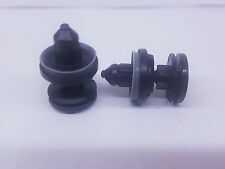 Vauxhall / Opel Part Number : 90321122. 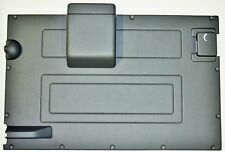 They are used to hold interior trim panels and door cards in place. 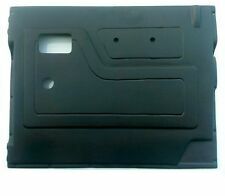 Land Rover Discovery Rear Door Clip. Land Rover Part Number: DKP5279L. If there are any problems, then we will try to resolve them for you. 100 pieces x universal car lock. Widely used for car fender, bumper, door or other car suface. These rivets are the plastic material. The star-scores are very important to us. VW Part Number 7L6 868 243. Best Quality. 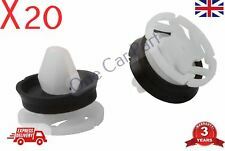 Manufacturer Part Number: 7L6868243, 7L6 868 243, 8679426. fit for Audi A7 Quattro 2014. fit for VW Passat / Golf / GTI 2014. 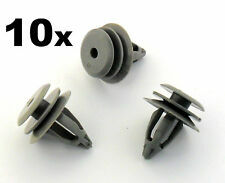 Item included: 10 x Fastener Clip. 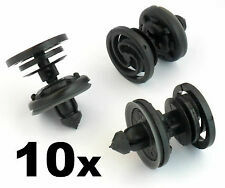 fit for Audi A4 Quattro 2013. fit for VW Beetle 2.0L, 2.5L 2014.